The Future of Food series of movies will be shown in three different Pima County Public Libraries at 2 p.m. on consecutive Saturdays from May 6 to May 20, 2017. 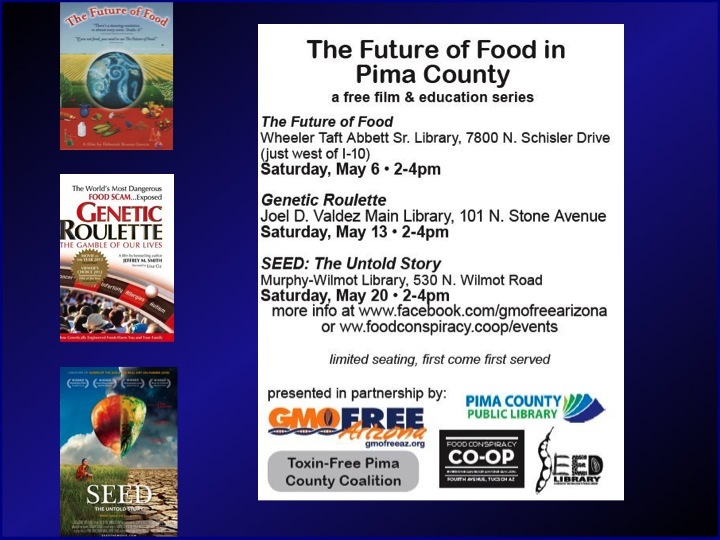 The free film and education series is presented in partnership by the Pima County Public Library, the Pima County Library Seed Library, Food Conspiracy Co-op, Toxin-Free Pima County Coalition, and GMO Free Arizona. Each movie will include a post-film discussion. The first movie in the series is The Future of Food, which will be shown this Saturday, May 6, at the Wheeler Taft Abbett Sr. Library in Marana. A post-film discussion will take place with Going Against GMOs author Melissa Diane Smith, farmer Anne Loftfield of High Energy Agriculture, and Nurse Janay Young. On Saturday, May 13, at 2 pm, Genetic Roulette: The Gamble of Our Lives will be shown at the Joel Valdez Main Library downtown. The series concludes with SEED: The Untold Story, which will be shown at the Murphy-Wilmot Library on May 20. The last time this movie was shown in Tucson – in the 500-seat main theater at the Loft Cinema on February 5 – it sold out. All events are free, but seating is limited. So, make sure to get to each movie screening early to ensure that you can view the film. Each movie received a rating of 7.0 or higher on the Internet Movie Database. Below are the details of each showing. Hope to see you at the movies! This film offers an in-depth investigation into the disturbing truth behind the unlabeled, patented, genetically engineered foods that have quietly filled grocery store shelves for the past decade. This seminal documentary provides compelling evidence to help explain the deteriorating health of Americans, especially children, and offers a recipe for protecting ourselves and our future. In the last century, 94% of our seed varieties have disappeared. As chemical companies control the majority of our seeds, farmers, scientists, lawyers, and indigenous seed keepers fight a David and Goliath battle to defend the future of our food.